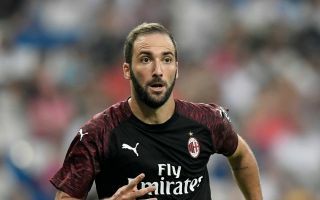 AC Milan striker Gonzalo Higuain returned to first team training on Friday morning after sitting out the club’s 1-1 draw with Real Betis. The Argentine striker was forced to miss the Europa League clash on Thursday night after sustaining a hip injury against Udinese last Sunday. The 30-year-old moved to the San Siro from Juventus during the summer transfer window and has made a solid start to life in Milan, scoring seven goals in his first 12 appearances across all competitions. Gennaro Gattuso’s side certainly missed his goalscoring prowess in the final third against Betis, but he may be ready to return against his former club in a huge Serie A clash this weekend. According to Sport Mediaset, Higuain was back in training on Friday morning and will be available for selection this weekend, which is a huge boost for the club after initial fears that the centre-forward had suffered serious damage. However, the Italian boss can now rest easy knowing his star player is back in the fold and look ahead to the visit of Juventus with plenty of attacking options at his disposal. Milan have a number of key players out injured at the moment, with Lucas Biglia, Mattia Caldara and Jack Bonaventura all sidelined, but they have still managed to win five of their last eight games. AC Milan v Juventus kicks off at the San Siro at 7-30 on Sunday night, with the hosts looking to close the gap on their rivals to seven points in the league table.